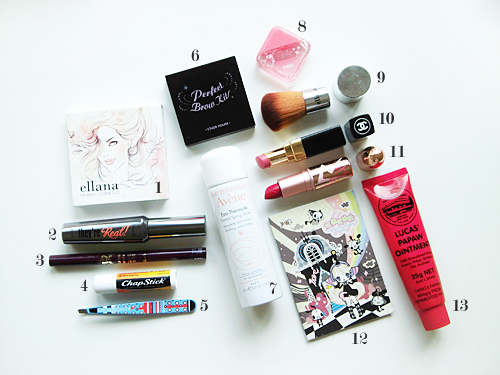 Ari's In Wonderland: What’s In My Makeup Kit? Part II. What’s In My Makeup Kit? Part II. I consider myself a pretty practical person when it comes to what I tote around in my bag everyday. I tend to bring only the essentials: a foldable umbrella, my wallet, the occasional book and sunglasses, my phone, a small bottle of hand sanitizer and perfume, tissues, and a power bank. If I’m supposed to be at work that day, I also have to bring along my pencil case. Despite only bringing what I only need, my bag still sometimes ends up pretty heavy. That’s okay though. I’d much rather come home with a sore arm or shoulder than fret over something I left at home while I’m out. Of course one other item that’s always in my bag, at least on most days when I’m not required to bring only a tiny clutch or similar, is my makeup kit. It may be silly, but I always feel a tad bit vulnerable if I don’t have it with me at all times, especially because I try to make sure my makeup looks the best it can at all times so retouching when needed is a must for me. The last time I made a post like this, part one, was over two years ago so I felt an update was long overdue. Let’s take a peek now, shall we? I change my makeup kit quite often, actually. But for the past couple of weeks I’ve been using this Benefit pouch that the girls at Benefit Philippines gave me. Isn’t it cute? The size is just perfect for me too because it doesn’t take up a lot of space in my bag and can fit everything I need inside. It’s also not ‘slouchy’ and has a defined shape, meaning any fragile items inside, like blush and lipstick, are more protected. Ellana Minerals Pressed Mineral Blush Duo in “Obsession/Fulfillment” – I change up the blush in my kit depending on what I’m using for the day, but one of the blushes I use the most is this from Ellana Minerals. It’s pigmented and easily buildable so you can go from having a soft, natural looking flush to one that’s more bold and intense. It comes with two shades already, a “sheer raspberry red” and a “watermelon peach & gold shimmer”, so feel free to mix them or use each one separately. Benefit They’re Real! mascara – Despite the fact that this sometimes smudges for me on days when I get quite sweaty or my eyes are more watery than usual, I still love the impressive volume and length this gives my lashes so it’s in my kit frequently. Heroine Make Smooth Liquid Eyeliner #01 Black – I am and have always been a cat eye kind of girl and this eyeliner from Heroine Make helps me get that perfect, neat looking line and flick. The super fine, dual-purpose tip helps a lot! The formula glides on and it delivers a pretty intense black pigment. ChapStick Ultra SPF 30 Skin Protectant – I’ve gone on and on about my dry lips on this blog so it’s no surprise I always have lip balm with me. What makes me use this particular one the most is that it has SPF30 in it! Yes, even our lips can get damaged from the sun so be sure yours are protected too. Tweezerman Slant Tweezers – Every girl needs a good, sturdy set of tweezers in her bag. Not just for beauty purposes, it can help in emergency situations too like when you need to get rid of a splinter (which this has done for me before)! The pair I have is from the limited edition Cynthia Rowley collaboration collection. I really like the sharp edge the Tweezerman slant tweezers have because they can really get at those tiny hairs that need plucking and if you’re careful, helps you ‘dig out’ nasty ingrown hairs too! Etude House Perfect Brow Kit – I try not to spend too much time on my brows when getting ready, especially since all I really need to do is fill them in a little as they’re already quite dark and thick. This kit from Etude House is great for someone like me who’s pretty low maintenance with my brows. It comes with two brown shades (a medium and a dark brown) and a (brow bone) highlighter, as well as a mini spoolie and brush applicator so I don’t have to bring my own. Avène Thermal Spring Water – As I mentioned, I live in a country with a climate that’s hot and humid pretty much all year round, so I love using this facial spray to freshen myself up whenever I feel like it and to also re-hydrate my dry skin. It’s also great for sensitive skin that’s easily irritated by either makeup, pollution, or heat. Rohto Lycee Contact – I wear contacts a lot, circle lenses in particular, so I always need to make sure I have eye drops around because my eyes can easily dry out with them on. This one I got from Tokyo has an amazing, cooling effect on the eyes too! Read my review on it here. Ellana Minerals Baby Buki brush – I used to bring 1-2 full sized brushes in my kit, usually a powder and blush brush, but the bristles would constantly either get ‘bent’ from all the tumbling around it does inside, plus it was in a cramped space, or get snagged in the zipper. Thankfully this small, kabuki brush, also from Ellana Minerals, is tiny enough to easily fit inside and it comes with a cap to protect its soft bristles at all times. Chanel Rouge Coco Shine in “Saga” – Like my blush, I often change up the lipstick in my bag also. At the moment it’s this pretty, pink one from Chanel that’s perfect for everyday because it makes my lips look fuller, healthier, and it’s definitely a MLBB type of shade. MAC RiRi Woo – There are times where I have to attend events at almost the last minute, so I always need a classic and reliable shade of red in my kit for me to be able to instantly glam up, especially if it’s an evening event. RiRi Woo is one of my favorite lipsticks ever because the formula is long-lasting and has a smooth, beautiful matte finish. I find the shade also compliments my skin tone nicely. Read my review here. Blotting paper – This cheap, no-brand blotting paper is something I just picked up at a department store one day. I found the design on it too cute to resist not getting. I’m sure it has an official brand name of sorts, maybe, but all the info on the back is in Chinese. It’s not the best blotting paper around, but I can’t complain for something that’s less than PHP20.00 or 5 cents! Lucas Papaw Ointment – Who hasn’t heard of this wonder product? I always bring it with me for times I need to soothe any sudden insect bites or irritated skin, as well as dry patches on my face or anywhere on my body. That’s it for the quick journey into my makeup kit! I’m thinking of also doing the popular “What’s in my bag?” type post soon. Let me know if you’d like to see that! Do you also use any of the products I mentioned? Which one/s would you like me to review in the future? If you’ve done a post like this yourself, link me to it! I’d love to have a read!